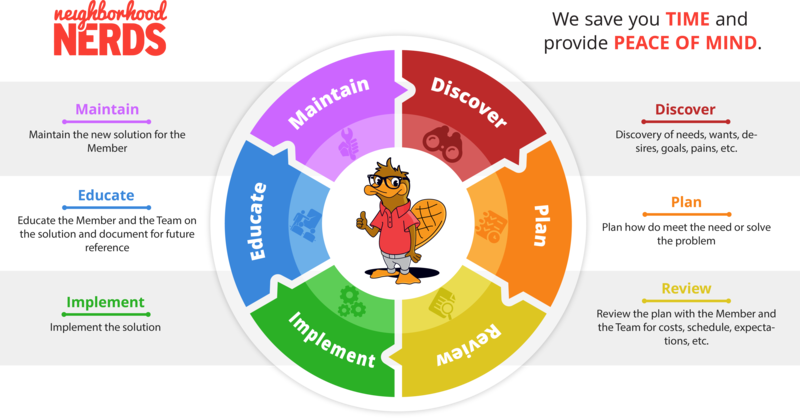 Gizmo™ is our mascot, our guide, our example, our destination on the path to becoming a true platypus. G.C.o.C. is designed to ensure all Nerds deliver the best care possible EVERY TIME! Discover - When a Member submits a Request or we generate a Request on behalf of the Member, the first thing we do is spend time fully understanding the Request of the Member. We ask questions, we explore, we engage, we invest time making sure we understand what the Member needs, why they need it, when they need it, how they want it, and who they want to deliver it. Plan - The next step is to research our possible solutions and responses. We need to understand how much the solution will cost. The time impact to deliver the solution. The complexity of the solution. The resources needed to deliver the solution. Review - Next we take time to carefully discuss the solution with the Member. We want the Member to be completely aware of the costs, timing, complexity, implementation plan, and more. We never want the Member to be surprised about any part of the solution we’re planning to provide. We also want to hear any new information from the Member as we describe the planned solution. Sometimes hearing the plan jogs the Member to provide additional information. Implement - This is when the solution is implemented. Implementation could be installing a TV, cleaning up a computer, setting up a new network, teaching how to use excel, assisting with creating Christmas cards, raking leaves, planning a trip, buying a phone, etc. Educate - This is when we update documentation, post new Gizmo Guides™, update the Member’s profile, create Member Manuals, etc. Maintain - We maintain all solutions we provide for Members. We do this be capturing all user manuals, drivers, software, etc. so we can always support the solutions we install. We also create maintenance plans for any products requiring continued attention, updates, maintenance. We also track warranty information so we can leverage the OEM’s support without incurring additional charges.